On June 16, my oldest brother died (at 84). My wife and I started packing that day, traveling 800 miles in 2 days for the viewing and next day funeral. It was a return to the northeast corner of Ohio and Catholic country; a different culture, in a way. Now there are those who will argue that a culture must include its religion, but I disagree. I can see a New Orleans jazz funeral sans religion, Corpus Christi without Christi. Such has been the case in Scandinavian countries. Northeast Ohio has not learned this. My siblings and I were raised Catholic. Our births were stretched out over quite a few years. I was the fourth of five, and by the time my younger brother arrived, the religious influence was not as strong. The oldest of us became very Catholic. Suffice it to say what kind of funeral I expected. My younger and only remaining brother and I were pallbearers. We carried the casket the long haul down to the front of the contemporary and stylish church. I was instructed to take the first pew, the others to follow. I went down to the end and exited down the next aisle and into the outside hall. My wife asked me to at least sit in the back row. I told her, “I don’t want to be any part of this,” and, “Someone has to protest for the children” (this being a cause especially sensitive for me), though I knew they would not make a connection. Meanwhile, the mass continued; the “cracker worship,” one might say. I walked the vestibule, the hall leading off to adjoining rooms, and studied the posters (“Is God in your marriage?” I wrote, “No!” on that). Half an hour later, my brother joined me, telling me he was tired of, “Kneel, stand, sit,” and that he had been sitting through it all. The service went on, small choirs singing with the congregation, the organ booming. 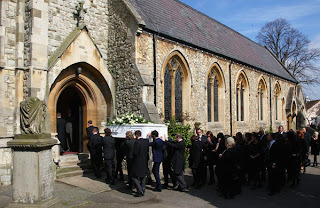 We delivered the casket to the waiting hearse. He would be cremated. Today is the day after and I think I should share my atheist thoughts arising from this experience, some of which can be said in short form: the viewing of the departed has become not so somber anymore, as I remembered it to be, but a social function bordering on an extended family party. The poem on the cards printed for the deceased was much more of a humanist statement than a religious one. But I came to the conclusion, as a result of being an outsider standing outside in the hall, that those within had suspended (perhaps “abandoned” would be a better term) thinking; sheep to their pastor (which, after all, means “shepherd”). But something more occurred. There is a connection between what was taking place within the church and what happened outside whenever I tried to have a dialog with them on their beliefs for, at some point, their minds “entered the church,” they abandoned logic and all thinking, repeating the words, say-after-me-style, that they heard inside. Believers think they are open-minded individuals. I, and others who are not believers, find the opposite to be true. Believers are in a kind of post-hypnotic state, reacting unawares to key words, phrases, instructions, as if still under the influence of hypnosis. Let me posit for your consideration that church-goers are mesmerized. Any of us who have witnessed a hypnotist’s exhibition is aware of what a “post-hypnotic suggestion” is. Believers are in a kind of post-hypnotic state, reacting unawares to key words, phrases, instructions, as if still under the influence of hypnosis. Something has been accessed to hijack the normal reasoning processes. And it has been accomplished via social forces, sometimes. I have carried with others the remains of my brother, along with our memories of him, what he was to us and not what he was to himself. What he did for us, his loving, laughter, tears, sexuality, his progeny. No one seemed to mourn his dying as one does in a tragedy. He lived life fully. Like him, there will be no “me” ever again. Later, after the program ended, I had an angry shout because I’d left my vitamins behind and would not be “bothered” by a discussion with my wife on where they might be. Later on I realized that this was just the last straw, that my anger was misplaced, for the real cause was the example in the TV program of how far a religion will go to preserve itself – even to destroying the innocent merely for disagreeing. I remember grade schools which taught about Christian martyrs, who died for the faith. Funny, they never taught us about those who were killed for going against the faith. And what did those persecutors, crusaders, and killers prove about the truths of their faiths? (Other than when a religion is in power it corrupts, and when it has absolute power it corrupts absolutely.) Faiths prove nothing and are contrary to the reality of the natural world. Simply put, the martyrs “for the faith” are those who gave their lives to support the irrational claims of those they trusted and believed. So it will ever be.